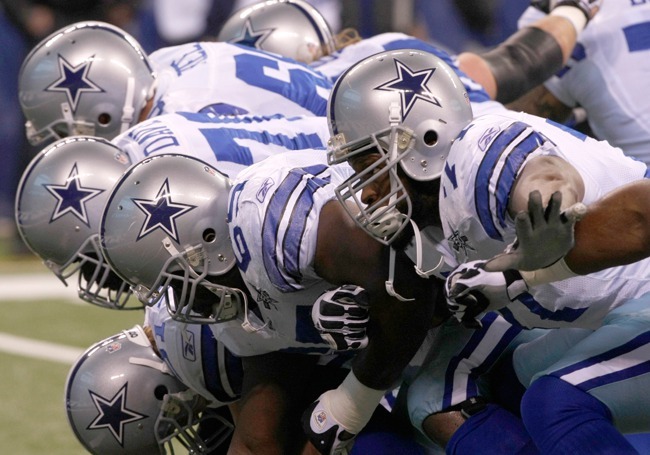 Dallas Cowboys | Most valuable sports franchise in the U.S. The average National Football League team is now worth $1.04 billion, 1.4% more than last year. During the 2010 season average revenues for the league’s 32 teams rose 4% compared with the previous season, to $261 million. Although operating income (earnings before interest, taxes, depreciation and amortization) fell 8.1%, to an average of $30.6 million per team due to higher costs for stadium operations, training facilities and marketing, the new collective bargaining agreement will give owners a bigger slice of overall revenue. The biggest winners are high-revenue team owners who will see their revenue sharing payments to their low-revenue rivals drop. In part this explains why the value of the top 10 teams rose 4% on average. “The new CBA provides owners with a level of certainty as well as greater profitability,” says Marc Ganis, president of consultancy SportsCorp. The 10-year deal, the result of a four and a half month lockout of its players, ensures labor peace for the next decade as neither side can opt of the agreement. Owners will pay players 47% to 48% of total revenues under the new pact, down from 51% under the old CBA. We estimate the NFL’s 32 teams generated a total of $8.3 billion in revenue last year, which is a 4% gain from 2009 (our figures include the net proceeds the teams receive from sources like merchandise and NFL.com). Under the new CBA, teams will receive around $250 million per year more at first based on the new revenue split. That figure will climb substantially as the league negotiates new television contacts over the next 12-months. The current deals with CBS, ESPN, FOX and NBC expire after the 2013 season and owners are expecting increases up to 60% on the current $3.1 billion average annual value of those deals (DirecTV brings in additional $1 billion each year). Given the league’s high television ratings and the lust males between the age of 18 and 45 have for watching football, such a boost is not inconceivable. Led by maverick team owner Jerry Jones, the most valuable team for the fifth straight year is the Dallas Cowboys, worth $1.85 billion, up 2% from last year. Jones and his Cowboys continue to find ways to leverage their powerful brand. In 2008, they launched Legends Hospitality Management, a stadium-logistics business run in partnership with the New York Yankees and Goldman Sachs. The $1.2 billion Cowboys Stadium opened in 2009 with a splash thanks to its 160-foot wide scoreboard and seating for up to 100,000 for special events. The latest venture is Silver Star Merchandising, a Cowboys-owned company, which signed a deal this year with the University of Southern California athletic department to make and distribute merchandise (excluding team jerseys and sideline apparel). The 10-year deal begins with the 2011 football season. Cowboys Stadium continues to be a gold mine for Jones. The 320 suites and 15,000 club seats at JerryWorld generate $115 million in revenue annually. Sponsorship revenues are $50 million even with the Cowboys inability to ink a naming rights partner for the venue. The Cowboys earned $119 million in operating income last season, the most in the NFL for a second straight year. The Giants (No. 4 at $1.3 billion) and Jets (No. 5 at $1.22 billion) saw their values rise 10% and 7% respectively as the new $1.4 billion stadium they share opened in 2010. The lousy economy hindered ticket sales and both teams failed to sell out their club seat inventory. The Jets in particular were forced to slash some personal seat licenses for season tickets by 50%. It still represented a dramatic upgrade financially for both teams. The Giants saw premium seating revenue jump from $8 million to more than $50 million. The Jets doubled sponsorship revenues to $35 million annually. The fortunes of both teams got a further lift in August when MetLife agreed to spend more than $400 million over 25 years for the naming rights to the former New Meadowlands Stadium. It is the NFL’s richest naming rights deal ever. There is a growing divide between the rich and poor NFL franchises (poor being a relative term as all 32 teams rank among the 50 most valuable sports teams in the world). Supplemental revenue sharing payments to low revenue teams under the old CBA were expected to rise to $220 million with high rolling teams like the Cowboys, Washington Redskins (No. 2, worth $1.55 billion) and New England Patriots (No. 3, worth $1.4 billion) supplying much of the welfare and on the hook for more than $10 million apiece. Under the new CBA, the amount any big market teams will have to kick into the system is capped at $3.5 million. Low revenue teams will receive only $50 million to $100 million collectively in the early years of the deal according to NFL estimates. Leaguewide revenues are expected to increase to the point where supplemental revenue sharing almost disappears by the end of the new 10-year CBA. The new CBA hurts teams at the bottom of the financial pyramid as well because beginning in 2013, teams must spend 89% of the salary cap in cash or be subject to penalties. Keeping a lid on player costs allowed the Tampa Bay Buccaneers to be football’s fourth most profitable teams over the past five years. The Bucs’ player costs were $35 million lower than any other team during that time and $150 million less than the Cowboys. The Chiefs, Bills and Bengals have also kept spending in check fattening up the bottom line. That is not an option anymore. While the value of the top teams is up, the bottom 10 stayed flat on average. Teams have increased spending in recent years which was the owners’ rational for voting in 2008 to end the CBA early. Player costs doubled between 1999 and 2009, but other expenses also soared. New practice facilities have popped up for teams like the Jets and Seahawks which can cost several million dollars a year to operate. Coaching salaries have exploded with many head guys earning $5 million annually and assistants collectively earning $7 million. Teams are assessed more than $10 million annually to run the league offices and invest in new ventures like NFL.com. The lousy economy has forced teams used to automatic sellouts to spend more on marketing to move tickets that average $76 leaguewide according to Team Marketing Report (club seats average $239). NFL teams got a reprieve in 2010 thanks to the rules of the old CBA in an uncapped year regarding player benefits. Each team only had to pay a portion of player benefits and was able to keep $10 million in payments that normally would have been made in a typical NFL season with a salary cap. The effect was a 1% drop in total player costs to $4.4 billion. Teams earned $30.6 million in operating income on average last season. One small market team who is muscling in the on the big teams is the Green Bay Packers. The Green Bay metro area has only 307,000 people in it and is 70% smaller than any other metro with a major pro sports franchise (Ottawa is the second smallest). This pipsqueak population figure means the Packers generate $312 in local revenues per person in the area, seven times the league average. The Packers rode their Super Bowl victory over the Pittsburgh Steelers to a 7% increase in value and the publicly held franchise is now worth $1.09 billion, ninth highest in football. The team announced plans in August to add 6,600 seats and bigger video screens to Lambeau Field in time for the 2013 season at a cost of $130 million. The renovation is expected to increase revenues by as much as $13 million annually (see “The Power of the Packers”). NFL teams are prized assets that rarely change hands. Controlling interest in only four teams was sold during the past 10 years and the Miami Dolphins are the only one of the 25 most valuable to get a new owner. The reason is NFL teams almost never lose money, unlike their counterparts in the NBA, and values keep going up. Most teams have double-digit operating margins and the average franchise value has increased 122% over the past decade (the S&P 500 is flat over the same period). The new CBA and coming TV deals ensure the NFL will maintain its role as the richest sports league in the world.